Marlene presenting a cheque to Sam in front of the Norwood Theatre. 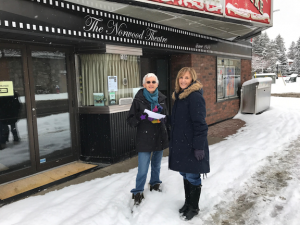 Spinning Reels, a volunteer group of movie buffs who bring alternative films to Bracebridge at the Norwood Theatre, had a very successful year. As they have done every year since their inception, the group generously gives back to the community. Manna is grateful to be one of the groups to benefit from that success. Here is Spinning Reels treasurer Marlene Vettorel presenting a cheque to Manna volunteer Sam Robinson. Thank you for your hard work, Spinning Reels; for the wonderful films you bring and for thinking of Manna yet again. Visit the Spinning Reels website to learn more about them, check out the schedule and sign up for their e-newsletters. Merry Christmas everyone! And please remember, much as we appreciate donations of food, Manna is also very grateful to accept cash donations. They ensure we are able to keep our shelves stocked with necessary items year-round. Hunger is not seasonal!